One by one I’ve been exploring the attractions in Atlanta. Now I’m not much of a tourist, but one has to appreciate the tourism in their home state. And since we’re still relatively new to the Atlanta area, I feel like it’s a bit of a right of passage to visit key places like this in your area, especially during the holidays. We decided to put together a list of things to do in Atlanta for Christmas for anyone who’s visiting or new to the area. Rollercoasters, a giant Ferris wheel, funnel cakes, and a giant Santa—what more could you ask for? Especially if you’re looking to amuse your geeky side. You can find all these things and more at Six Flags Over Georgia Holiday in the Park. Rated as one of the best Christmas events in Atlanta, Six Flags returns with its fourth annual event Holiday in the Park. This event is perfect for the entire family and features special activities for the holiday season, including: Gotham City, North Pole Express, Peppermint Plaza, Mistletoe Mansion, Holiday Hill and much more. There are also special featured shows that are family friendly such as Looney Tunes Christmas, Retro Christmas USA Holiday Special, Christmas Tree Lighting, North Pole Express and more. Avalon is a shopping center located in the Alpharetta suburb of Atlanta. It’s perfect to finish up (or start) your Christmas shopping. Along with the array of stores to shop at, Santa pays a visit to Avalon almost every day to say hello to all the shoppers and their little ones. You can also take a break from all the chaos of Christmas shopping and go ice skating, catch a movie or enjoy one of their dining options. Come visit the Atlanta Botanical Gardens for its 7th annual Garden Lights display. Extraordinary lights are hung up all throughout the garden for an astonishing display of holiday spirit. The light display is only open from 5 pm to 11 pm on Friday and Saturday and 5 pm to 10 pm the rest of the week. So snag your tickets and get ready for a magical garden experience. This holiday season, head to Barnsley Resort located in the foothills of the Blue Ridge Mountains and watch how the famed gardens light up the night with an array of colorful holiday lights at the historic Manor House Ruins, which can be enjoyed through January 1. Additionally, the resort offers several holiday-themed events, perfect for travelers looking to get into the holiday spirit, including Campfire Sing-A-Longs, Holiday Crafts and Cookie Decorating. On Christmas Day, the new Georgian Hall will host an elaborate holiday dinner buffet where guests can indulge in signature holiday favorites and delicious desserts made by Executive Chef Starnes. Travelers can also book the ‘Light Up The Holidays’ promotion which includes cottage accommodations, $50 resort credit and a keepsake Barnsley Resort ornament, valid for use through December 27, rates starting at $219/night. Stone Mountain Park offers the perfect family-centered getaway for this holiday season. Aside from their normal activities of camping and exploring the grounds of the park, for the Christmas season, they offer special events. Some of them are a tree lighting ceremony, Rudolph the movie in 4D, a walk-through light show called ‘Skylights Spectacular,’ live Christmas music performances, a Christmas parade, and most importantly, a visit from Santa Claus. Travel up to Stone Mountain this Christmas season to experience all the activities it has to offer. The Fox Theater is the perfect place to see spectacular holiday-inspired shows this season. This year, the theater is performing the Nutcracker from December 8th-28th and ‘Mighty Mo & More!’—a holiday sing-along—on December 17th. As if these shows aren’t amazing enough, the theater will also perform ‘Sing An Irish Christmas’ on December 18th. To buy tickets and see show times, you can visit the theater’s official website. The Atlantic Station will be hosting something special to celebrate the Christmas cheer every day this month. The Atlantic Station is a neighborhood in Atlanta that has strips of shops down its walkways. Explore its streets where there is a Christkindl Market and an ice skating rink. Santa is also making an appearance each day, meeting shoppers and visitors in the market area. But best of all, the Atlantic Station has ten minutes set aside every day for ‘Snow Shows’ where it plays Christmas music as it snows in Atlanta. Talk about a magical atmosphere! As the holiday season comes upon us, the Atlanta Symphony Orchestra begins performing their holiday shows. Christmas music is the number one indicator that Thanksgiving is over and it’s time to pull out the Christmas tree. A Christmas orchestra show is not one to miss this holiday season, and the Atlanta Symphony Orchestra is the perfect one to see. Some of their shows include a Christmas holiday series sponsored by Coca-Cola and the show Messiah. You can see the times and dates of the show on the official website. The Center for Puppetry Arts performs entertaining shows with intricately designed puppets that will have anyone hooked for hours. This holiday season the Center is performing Rudolph the Red Nosed Reindeer as its Christmas special. Multiple showings are available throughout December at different times, so you’re bound to be able to make one! The Georgia Aquarium is one of the largest attractions in Atlanta for visitors, and this holiday season it’s hosting a special breakfast with Santa Clause. This event is perfect for little ones and adults alike. You’ll enjoy a delicious breakfast with Santa and then a day of viewing all the cool sea creatures that live in the aquarium. Sounds like a perfect Christmas adventure, if you ask us. Ranked as one of National Geographic’s top ten light displays of the season, this is something you definitely do not want to miss. Fantasy In Lights is a family-centered event hosted at Callaway Resort & Gardens. You can drive through the lit-up Christmas Village and see all the dazzling lights or walk through the village and meet special Christmas characters. Not only can you explore the town, but there are holiday-themed events happening every day that the whole family will enjoy. The World of Coca-Cola hosts fun holiday festivities throughout the entire Christmas season that you don’t want to miss. You can sign up for a tour of the company or meet the famous polar bear mascot for Coca-Cola (and even snap a photo with him). Coca-Cola fanatics will also love being able to sample their special holiday drinks or explore a special Christmas exhibit that jumps back in time and displays old Christmas Coca-Cola artifacts. Now from a consumer standpoint, I have always been a big fan of Coca-Cola branding. It’s one of the brands I grew up with and have seen woven into the fabric of American culture. But Coca-Cola has a much deeper message in their branding, one that emphasizes the beauty of special moments in life. And while I don’t drink Coca-Cola daily, it is one of those staples in my family that seem to surface during special dinners, road trips, and adventures. It’s always been there as an inanimate family member. When there’s Coca-Cola around something special is certainly happening. This kind of realization blended with my visceral passion for branding and the nostalgia of Coca-Cola left me eager to explore this Atlanta attraction. You will also find there is quite literally a world of things to do with World of Coca-Cola during the holidays, so head over to their website to get your tickets! Hosted at the Atlanta Botanical Garden, this show is perfect for all train lovers. An array of model trains are set up inside miniature towns around the garden—a unique sight to see even if you’re not into trains. Anyone can pop in during between 9 am to 10 pm and from November 11th-January 7th. 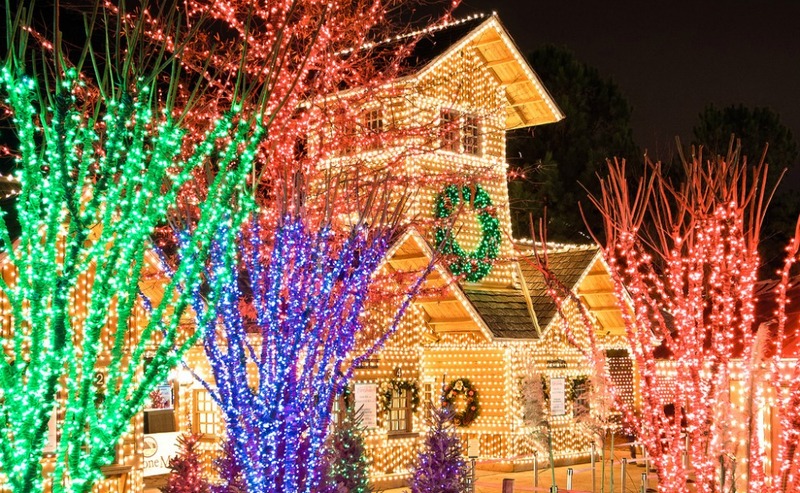 Whether you’re new to the Atlanta area like me or perhaps just visiting these places are sure to fill you with holiday cheer. Consider booking a tour! There is so much to do in the area we are sure you will have so much fun exploring with your friends and family. is too big for her small body so she likes to stand on tall surfaces and shout very, very loudly. but is always searching for her next hobby. Currently, she blogs at Trekbible.